Community First's Help and Support Directory is an easy to use directory of local community services. It has been created to help people connect with support services and community groups where they live. 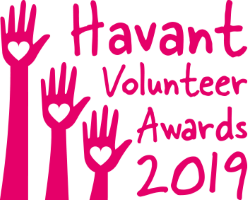 Havant Volunteer Awards: Nominations closing soon! Community First and Havant Borough Council are pleased to announce the launch of the Havant Volunteer Awards for 2019. The awards will recognise the time and energy given by volunteers to organisations across the district. It will be an opportunity to celebrate the dedication and enthusiasm of local volunteers who make such a difference to the lives of many residents. Any group or organisation operating in the voluntary and community sector in the Borough of Havant can make nominations. We’re also thrilled to announce that this year we will be offering a 2-night bed and breakfast stay for the 4 individual winners and their loved ones. They will have a choice of over 330 hotels across the UK, subject to availability. This is courtesy of Room to Reward, who provide well-deserved breaks to hidden heroes – the volunteers who give up their time to help those who need it most. The closing date for nominations is 5.00 pm Tuesday 16th April 2019. The awards evening will take place on Tuesday 4th June at 5.00pm. For further information on the awards and to find out how you can nominate a volunteer please visit the Volunteer Awards information page or contact Julie Eden from our Volunteer Service: julie.eden@cfirst.org.uk or tel. 01730 777514. Community First is the trading name of Communities First Wessex Registered Charity no 1147527. Company Registered in England and Wales 08071971. Registered Office – 3000a Parkway, Whiteley, Fareham, Hampshire PO15 7FX. Copyright 2019 Communities First Wessex. All rights reserved.